Mexican petunia is a tender evergreen perennial that forms 3’-4’ tall clumps with dark green foliage. The sturdy stems and lanceolate leaves are an attractive addition to low-maintenance perennial gardens. Plants produce a profusion of trumpet-shaped purple flowers at the tips of the stems. Varieties with white and pink flowers are also available. Flowers are irresistible to butterflies and other pollinators. Plants thrive in full sun to part shade conditions, but will bloom heavier in a full sun location. 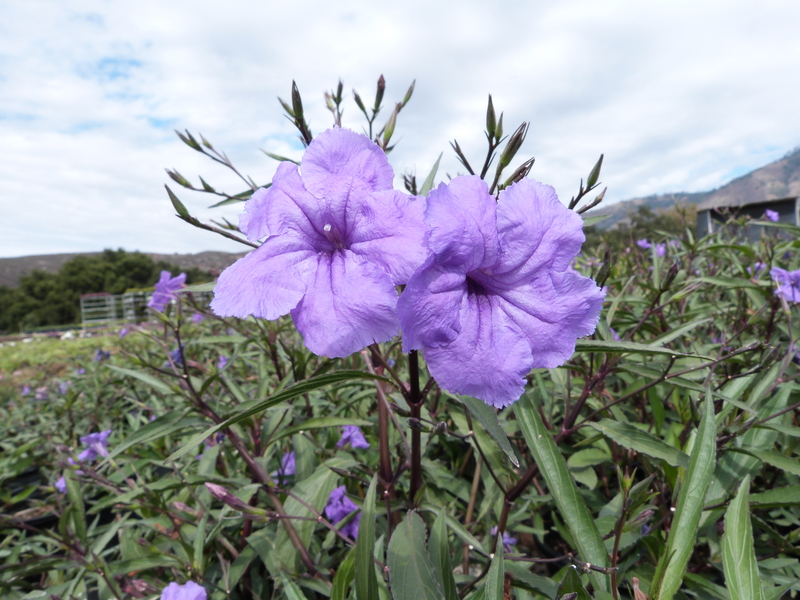 Mexican petunia tolerates a variety of soil conditions, including heavy clay. It is essentially a water-plant, but can adapt to dry conditions once established. The more water plants receive, the more aggressively they’ll spread. In warm climates plants are evergreen; while they may die down to the ground in marginal zones such as USDA 7.